English: Central Tokorozawa, Saitama from Hachikokuyama. 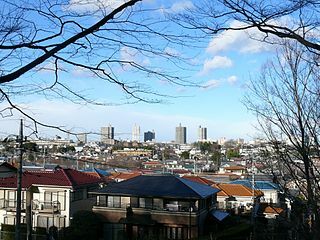 Français : Vue sur le centre-ville de Tokorozawa depuis Hachikokuyama (Saitama, Japon). 來源 Transferred from en.wikipedia to Commons. This work has been released into the public domain by its author, Bryanmackinnon at 英文 維基百科. This applies worldwide.